This week brings us another set of royals heading to parliament, a concert trip, and a royal return. Enjoy! 10. She's back! Queen Elizabeth II returned from Balmoral this week, and she brought a wonderful jewel out of the box to meet with diplomats at Buckingham Palace: one of the Hyderabad Rose Brooches. 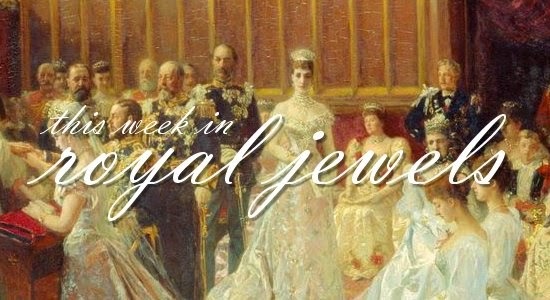 The brooches, made by Cartier, were originally a part of the tiara given to HM as a wedding present by the Nizam of Hyderabad; although she had the tiara remodeled, she kept the brooches in their original form. 9. The Danish royals gathered for the opening of parliament in Copenhagen this week, and Princess Benedikte (on the far right) wore a chunky necklace and gold earrings for the occasion. 8. Princess Marie's jewelry at parliament was a bit simpler but very elegant: a small silver-toned brooch, which looks sort of like a smaller version of Queen Ingrid's famous diamond daisy brooch. 7. The star of Crown Princess Mary's parliament ensemble was definitely the striking purple pillbox, but she also added a pair of small earrings. 6. One more Dane attended the opening of parliament, and it's the greatest Dane of them all: Queen Margrethe II, who wore large round earrings with her pale-blue hat and outfit. 5. In Spain, Queen Letizia wore a pair of delicate drop earrings while meeting with members of the public -- including her father-in-law, King Juan Carlos -- during a day of fundraising for the Red Cross. 4. Wearing bracelets with her purple dress, Crown Princess Victoria of Sweden joined King Carl XVI Gustaf on Friday to meet with members of the nation's new government. 3. For a visit to a social employment agency on Tuesday, Queen Maxima of the Netherlands added fun jewelry to her leopard-print outfit, including bold earrings, rings, and her usual set of bracelets. 2.Queen Silvia of Sweden chose pearls -- pearl drop earrings and the double-stranded pearl necklace that once belonged to Princess Sibylla -- for the presentation of the Birgit Nilsson Prize to the Vienna Philharmonic Orchestra. Love the sparkle here, Charlene! Anyone else hoping that both of these babies are girls, so that there's a future Sovereign Princess of Monaco to wear the family's tiaras?